On July 3 I pointed Sparky (that's my 2004 Ford Explorer) west from New Jersey. My first stop wouldn't be until Kansas City and I wanted to spend as much time as possible there the following day. So I drove and drove. When I topped 800 miles I thought it would be cool to top 1,000 miles of driving in one day. So I pushed onward until the odometer had clicked off 1,006 miles and I finally pulled over into a truck stop somewhere west of St. Louis for a few hours of shuteye. Along the way I had hit parts of New Jersey, Delaware, Maryland, Pennsylvania, West Virginia, Ohio, Indiana, and Illinois, before sleeping in Missouri. The next morning I finished off the drive to Kansas City and hit one of my favorite photography locations in town, the West Bottoms. 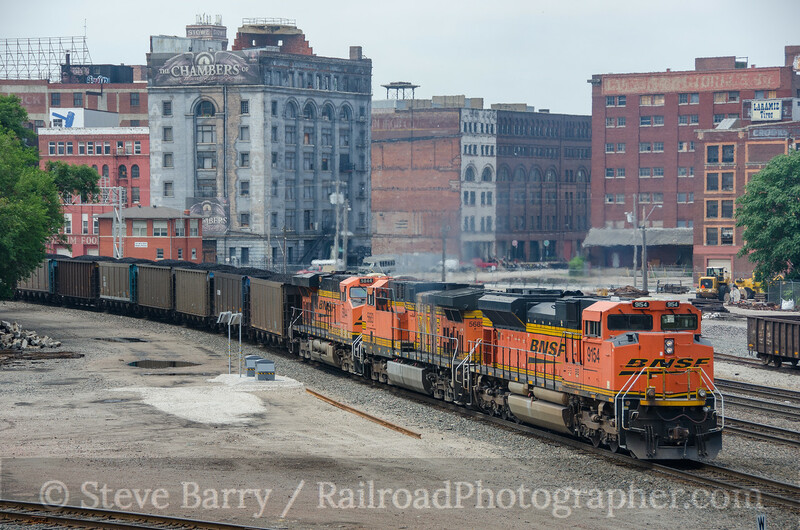 Here the railroads mingle with old brick buildings, forming one of the best urban backdrops to be found anywhere in the U.S. 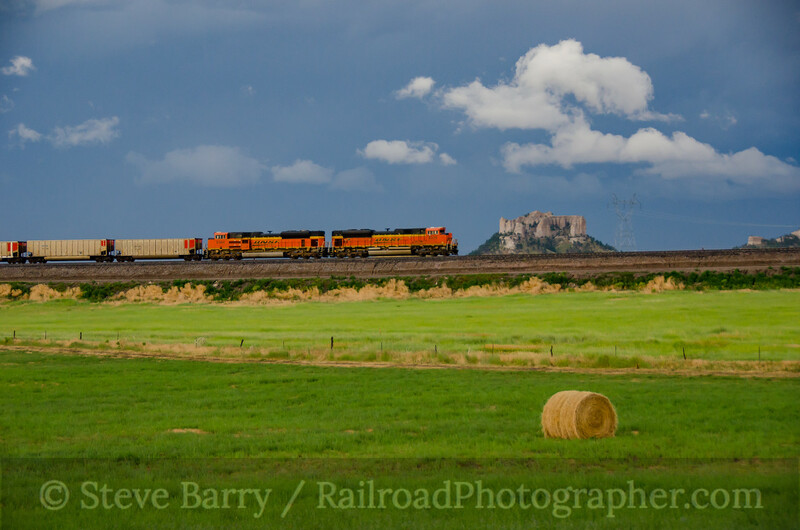 I did get a few trains here before moving on, including a BNSF coal train. From here I headed over to 27th Street in Kansas City. Trains heading east pass an old abandoned brewery as they leave Kansas (somewhere just beyond the brewery). The real attraction at 27th Street, however, is looking the other direction -- the triple crossing at Santa Fe Junction. 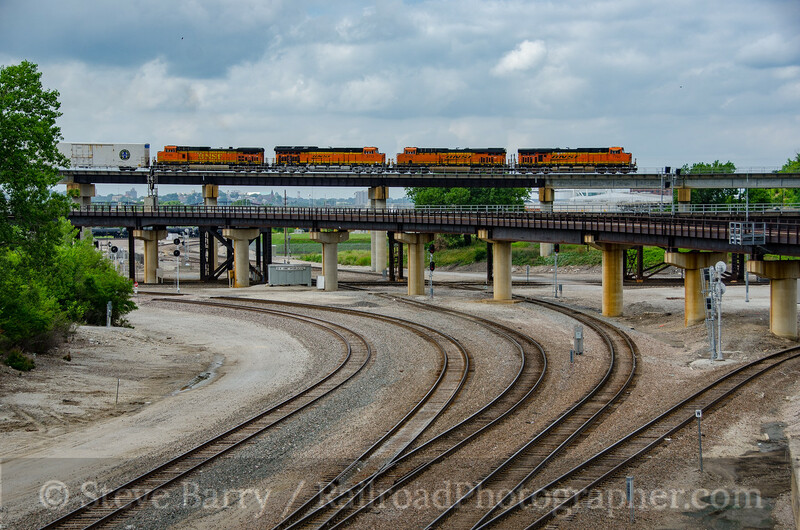 BNSF goes overhead on the highest bridge, with Union Pacific on the middle level. BNSF and Amtrak use the tracks at ground level. 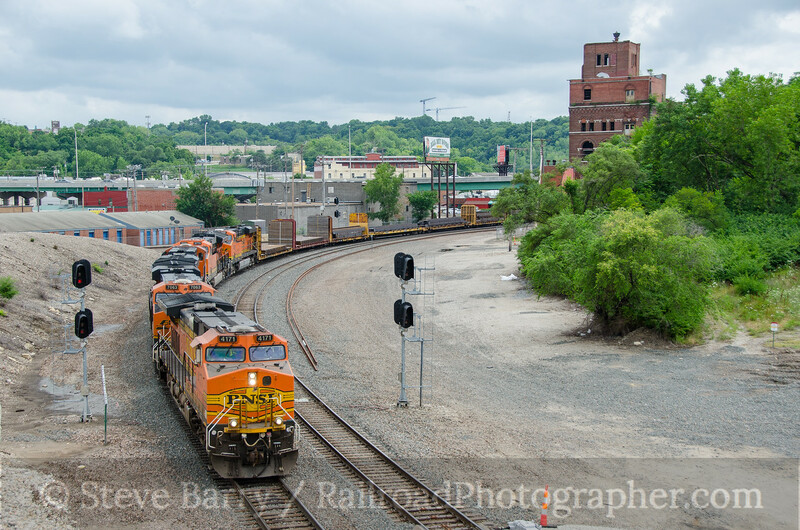 While it's not unusual to get two (and sometimes three) trains in one shot, this was a holiday (July 4) and while I eventually got trains on all three levels, it was only one at a time. 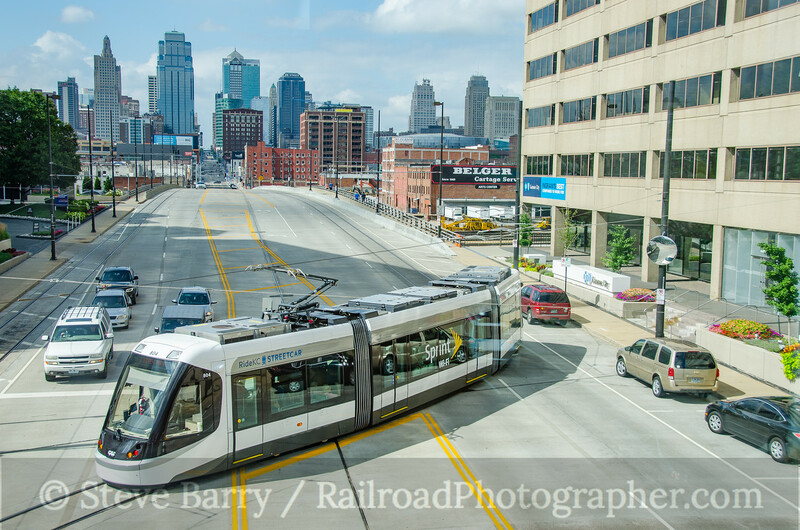 One reason I had picked Kansas City as my first stop was the presence of the new streetcar system in town. 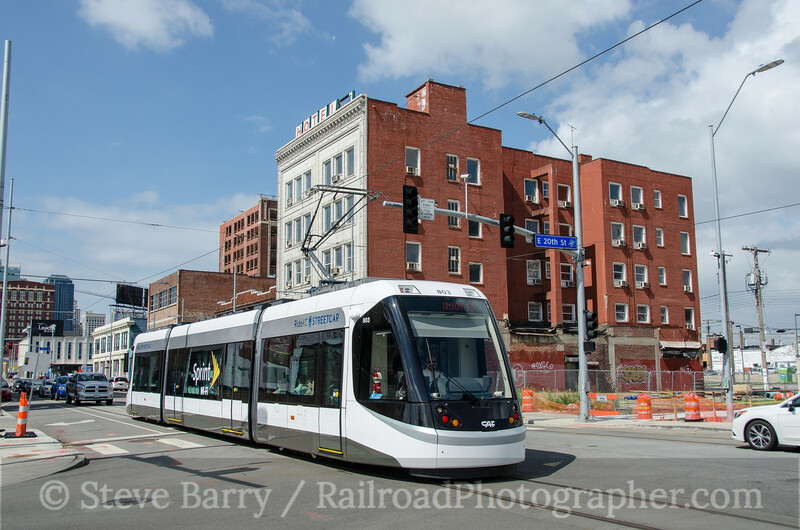 I eventually left the freight railroads and hit the city streets, getting a modern streetcar passing an old hotel not far from Union Station. From here I headed down to the streetcar's southern terminus at Union Station. 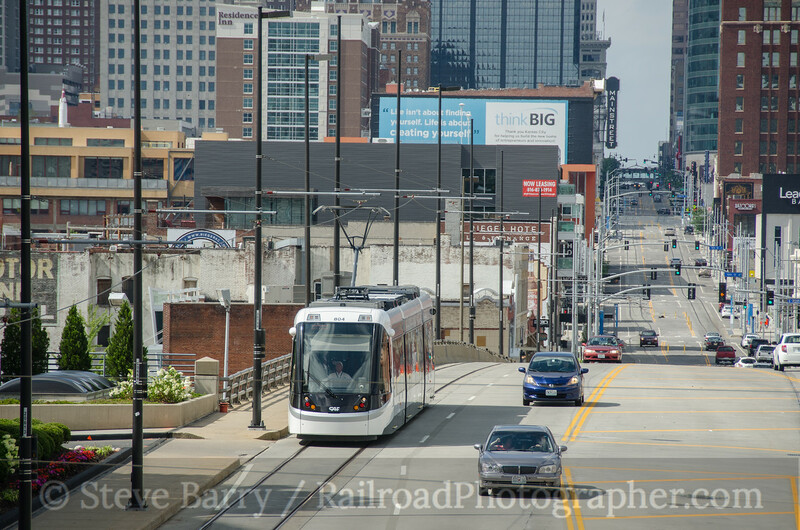 An overhead walkway provides a nice vantage point to see the streetcars coming south down Main Street. At Union Station the end of the line is served by a single track. Streetcars departing north have to leave the single track and pass completely across Main Street to get to the northbound track. Once done with streetcars it was time to push further west. My plan was to do some night photography every night if the situation was right. I headed west, clipping parts of Kansas and Iowa before entering Nebraska. The Union Pacific mainline across the state is very busy, so I knew if I set up somewhere along it I would eventually get a train. 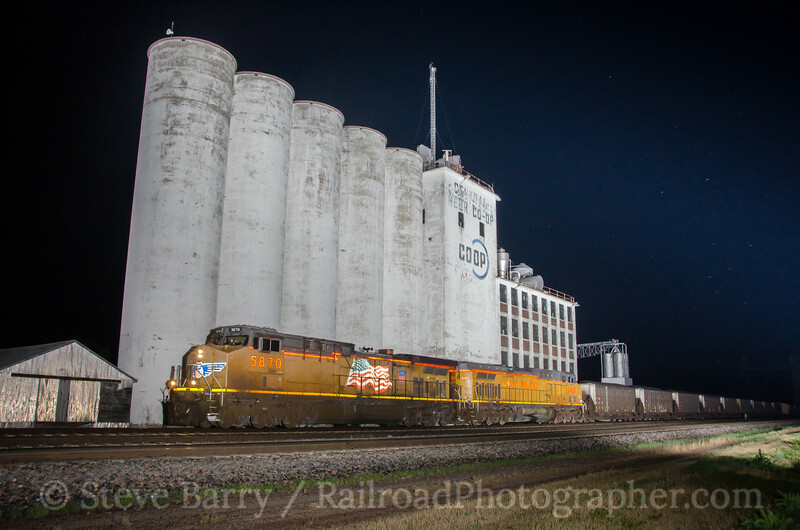 The grain silos in Gibbon looked like they would make a good backdrop, so I paused there a bit past midnight. 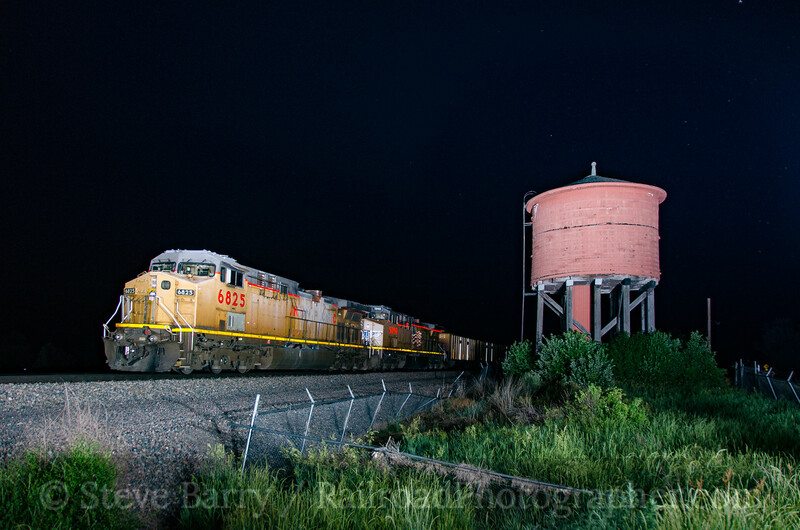 Not unexpectedly, I got a couple of trains in fairly short order before getting back onto the interstate, finally pausing for the night at a rest area somewhere east of North Platte. 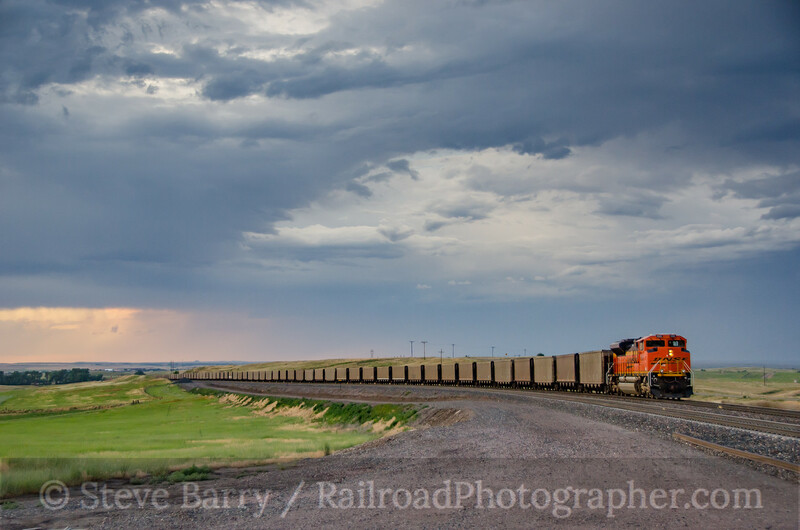 My next destination was coal country, specifically the Powder River Basin in Wyoming, so it was no surprise that coal trains started to dominate the rail traffic I was seeing. 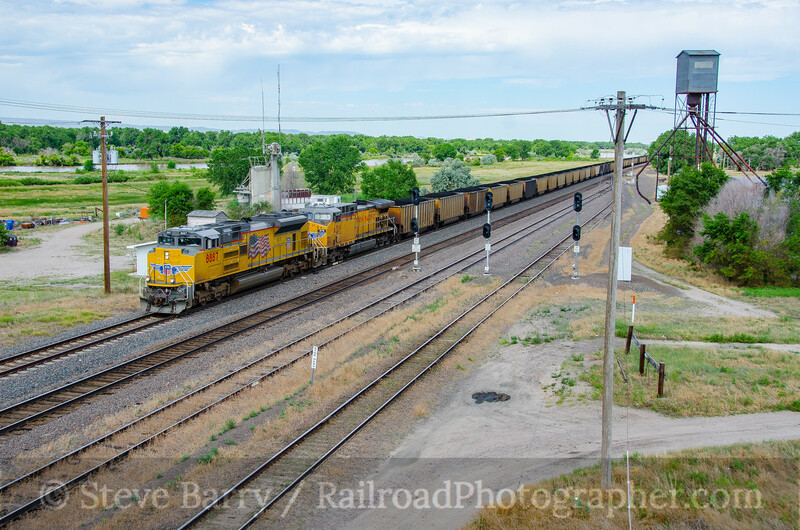 On Day 3 I followed UP's line through Nebraska, getting a westbound coal train at Lisco, Neb. 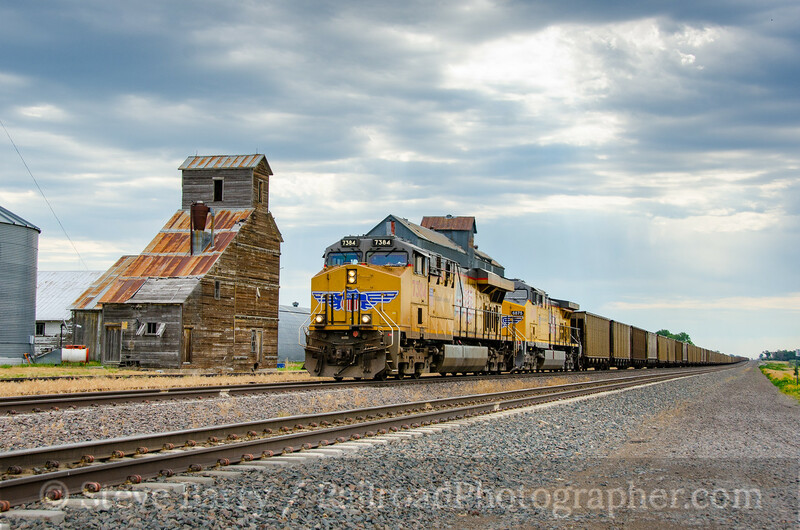 At Bridgeport, Neb., I found a UP train coming from the Powder River Basin loaded with coal. I also noticed that a tooth I broke two weeks earlier was starting to hurt. A lot. This wasn't going to be good. 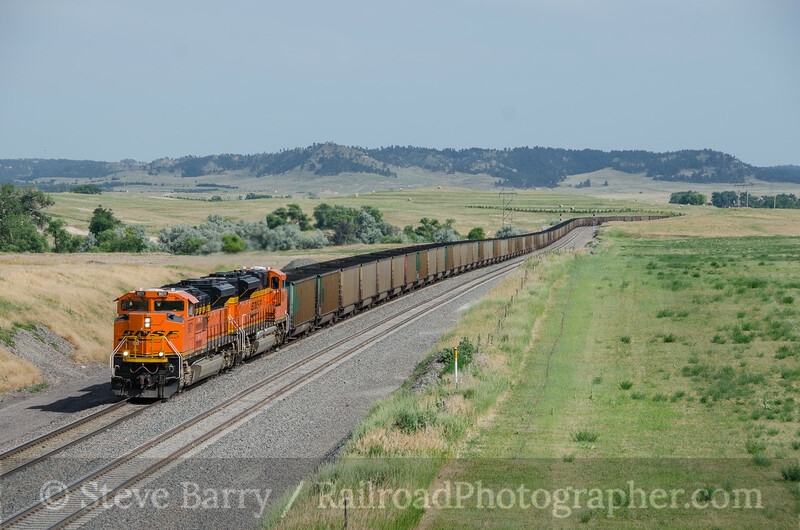 I wanted to enter the Powder River Basin by following BNSF Railway's line over Crawford Hill in northwestern Nebraska, so I swung north off the UP and picked up BNSF's line through Alliance. 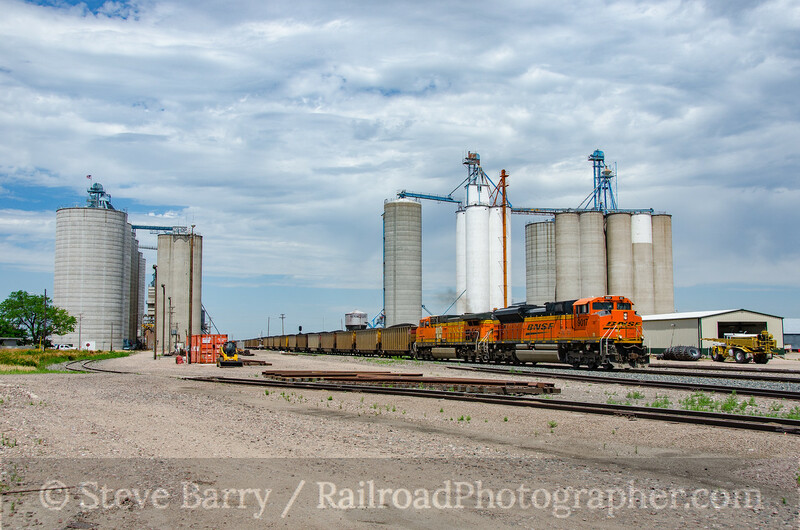 Among the trains I saw on BNSF was a loaded coal train coming through Hemingford. My research on Crawford Hill showed the area around the most scenic part of the railroad was on private property owned by the Ponderosa Ranch. It also showed the Ranch sold day passes to photographers to access the area. Upon arrival at Crawford, however, I found no signs pointing to the ranch, other than a sign to the "Ponderosa Land Management Area." It seems the ranch had shut down and/or been sold. A check of the ranch's website yielded a phone number, but when I called the person on the other end (who had apparently been asleep) had no idea what I was talking about. It looked like I would be limited to the very west end of Crawford Hill. It wasn't as spectacular as I had hoped, but was still scenic nonetheless. A very nice shot could be had from the overhead bridge near downtown Crawford. The curves at the very west end of Crawford Hill were accessible before entering the former Ponderosa property, and a brief storm in the late afternoon provided some dramatic dark skies just before sunset. An eastbound train headed up the hill as the storm cleared. A downhill train with a distributed power unit (DPU) on the rear pushing made for a nice sunset shot. Meanwhile, my tooth was really beginning to hurt and I started calling dentist offices to see if I could get an appointment. The nearest dentist office with an opening for the next day was in Wheatland, Wyo., some 120 miles away. Not good. 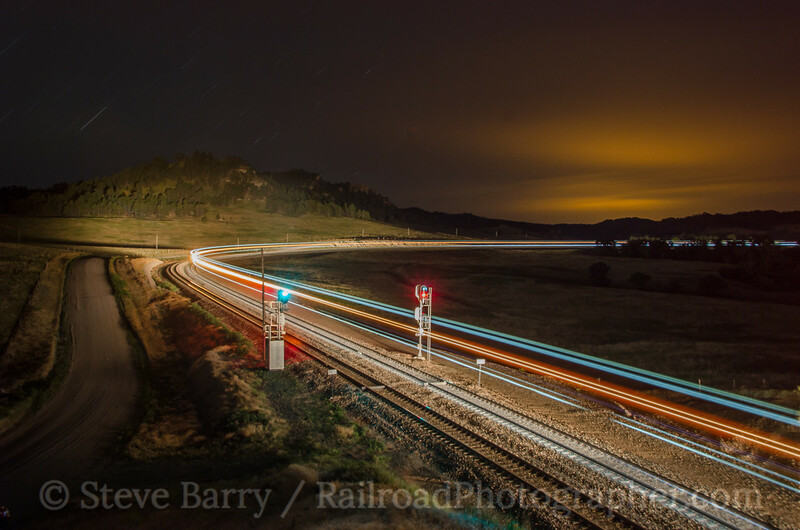 I made the appointment and stuck around the lower curves of Crawford Hill for a 13-minute exposure of a train going away around the curve. 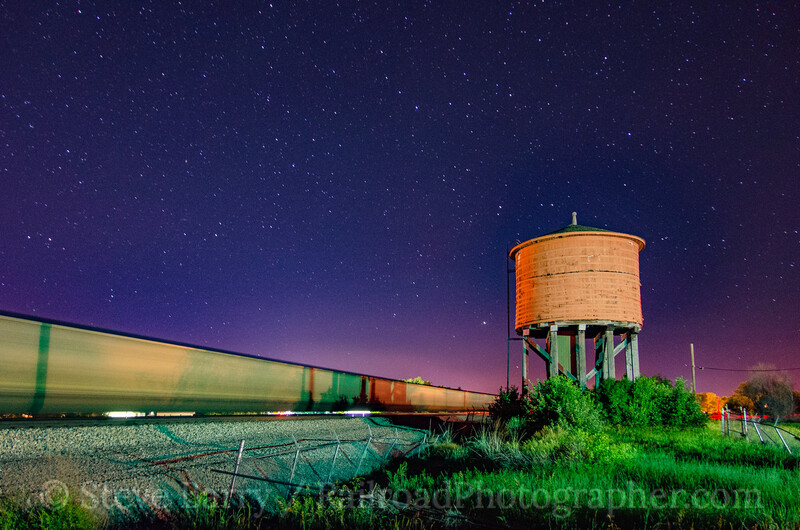 After getting shots with stars, I broke out my strobes and did some synchronized flash work, including the DPUs of a coal train heading towards the Basin. After a fitful night of sleep, Day 4 started with sunrise at the water tank (photo at the top of this entry). From there, it was off to the dentist at Wheatland (now a mere 80 miles away). The dentist looked me over, prescribed some antibiotics (and a pain killer/sleeping aid to get me through the nights), and sent me on my way. 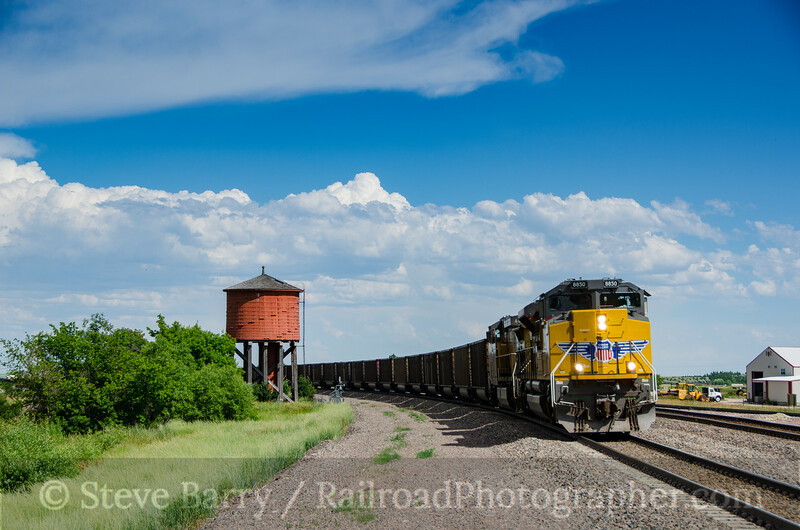 I headed back to Lusk and went almost back to the Wyoming/Nebraska line to get a westbound train at Van Tassel, Wyo. I should note that not every train I saw is posted here -- these are just the highlights. 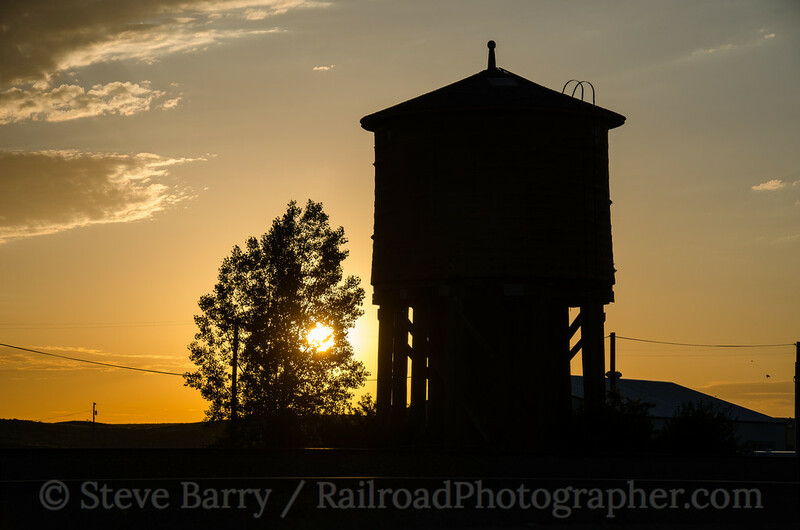 Finally, as the afternoon sun got lower, I headed back to Lusk for a daytime shot of a train passing the restored water tank. Can't wait to hear about the rest of the trip! Cross-country road trips are the best! Love your photography! Good stuff! I'll be hitting portions of the area on my way west in October.